Despite volatility, U.S. equity markets bounced back to close September with mixed results. The Dow Jones Industrial Average posted a 0.41-percent loss for the month, the S&P 500 Index was up 0.02 percent, and the Nasdaq led the way, gaining 1.96 percent. In general, smaller companies outperformed larger ones. The trend also marked the results for the quarter, with the Dow up 2.78 percent, the S&P 500 gaining 3.85 percent, and the Nasdaq again delivering the best performance, up 10.02 percent. Overall, these results represent the best quarter of the year for the U.S. stock market. Though market performance was strong, fundamentals weakened, as earnings continued to disappoint. According to FactSet, as of September’s end, third-quarter earnings are expected to decline 2.1 percent, which is down from the 0.3-percent gain estimated at the end of June. If earnings do drop for the third quarter, it will mean that earnings have been on the decline for 18 months─the first and only time that has happened since FactSet began collecting data in 2008. This continuing weakness is worrisome because fundamentals ultimately drive market performance. Technical trends remained positive throughout the quarter. All three major U.S. indices finished the period above their 200-day moving averages, and all three remained comfortably above the trend line throughout the month and quarter. From a technical standpoint, the market continues healthy. Developed international markets performed well during the month and quarter. The MSCI EAFE Index ended September up 1.23 percent, which capped off a quarterly gain of 6.43 percent. Technical trends also remained positive, with the index above its 200-day moving average during September. This marks a recovery, as the EAFE had fallen below its moving average due to volatility following the late-June Brexit vote but recovered by mid-August, staying above the trend line ever since. Emerging markets also performed well, as the MSCI Emerging Markets Index was up 1.32 percent for the month and 9.15 percent for the quarter. Continued action by central banks, and in particular the decision by the Federal Reserve (Fed) not to raise interest rates in September, has supported these markets. Technical signals were positive for the entire quarter, with the index remaining comfortably above its 200-day moving average. Fixed income posted mixed results for the month and quarter. Rates were volatile during the month, as the 10-year Treasury yield started September at 1.57 percent, rose to 1.73 percent halfway through the period, and ended at 1.60 percent. The Barclays Capital Aggregate Bond Index was down 0.06 percent in September and gained 0.46 percent for the quarter. Increased volatility in rates is possible heading into the elections, and the prospect of Fed announcements following the Federal Open Market Committee’s (FOMC) November and December meetings could further rattle fixed income markets. U.S. corporate high-yield bonds, as reflected in the Barclays Capital U.S. Corporate High Yield Index, performed well, up 0.67 percent in September and 5.55 percent for the quarter. The main driver of high-yield returns was a compression in spreads to the lowest levels in a year, with increased demand for U.S. assets driven by foreign buyers. Much like U.S. equity performance, the results for the economy released in September were mixed. The month started with bad news, as business defied hopes for a faster recovery by pulling back. Both the ISM Manufacturing and Non-Manufacturing indices declined in September, with the manufacturing index retreating into contraction territory and the nonmanufacturing index hitting a six-year low. Although the manufacturing index rebounded into expansion territory at the beginning of October, the weakness of both surveys suggests that recovery in this arena is likely further down the road. Not all business news was bad, however, particularly in the housing sector. The National Association of Home Builders survey beat expectations for September and reached its highest point since October 2015. The improvement in confidence indicates that home builders are increasingly optimistic about the future of the housing market. Even though housing starts and existing home sales dropped slightly during September, this was likely due to factors such as Hurricane Hermine in the South and historically low inventory levels. Home builder optimism was driven by strong consumer demand and sentiment, as consumers continued to feel better and make more money in September. Consumer confidence hit post-recession highs, as illustrated in Figure 1. 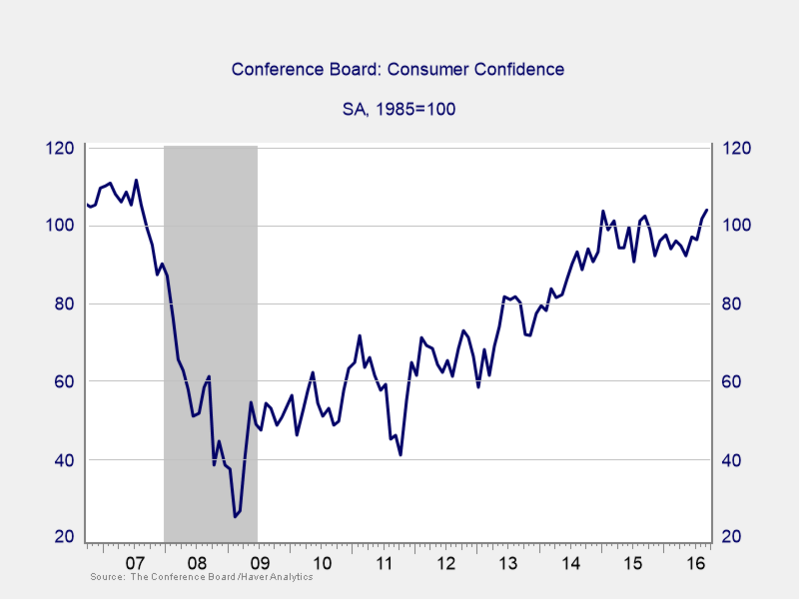 This improved level of confidence could bode well for increased household spending heading into the fourth quarter and on into 2017. Much of the gain in consumer confidence was engendered by continued job growth, as a healthy 151,000 jobs were added during August. Personal income also grew in August; one of the most impressive headlines released during the period was a 5.2-percent annual increase in real median household income. This represents the highest annual uptick since the mid-1960s and supports the notion that increased household spending could drive growth for the rest of the year. Despite the weakness in business sentiment, as expected, the FOMC decided to keep interest rates unchanged at its September meeting. Moreover, the committee’s discussion of the economy was largely positive. In many respects, by continuing to stimulate with low rates while remaining confident about the economy, it helped support financial markets toward month-end. For the second month in a row, international risks were largely subdued in September. Although there are causes for concern─with problems at Deutsche Bank, one of the largest banks in the European Union, at the top of the list─other issues such as the Syrian refugee crisis and China’s economy have receded as immediate threats. At this point, the largest risk to U.S. markets heading into year-end may be the presidential election. With just over a month to go, polls show both major candidates with a chance to take the White House. Because of the policy differences between the two candidates, consumers and businesses may be delaying spending and investment until they see what happens, which could lead to an economic slowdown in the short term. Additionally, markets may experience increased volatility if polls continue to show a close race. As usual, then, although there are catalysts for market volatility in the near term, the U.S. economy is growing and remains one of the strongest in the world. Increasing economic strength, combined with the largest financial markets on earth, signal that the long-term prospects for the U.S. are positive. The healthy increases in job and wage growth have helped provide a solid foundation for the U.S. recovery and indicate that growth, though perhaps at low levels, is likely to continue. As always, however, a well-diversified portfolio and long-term view offer the best route to reach financial goals, despite short-term volatility. Disclosure: Certain sections of this commentary contain forward-looking statements that are based on our reasonable expectations, estimates, projections, and assumptions. Forward-looking statements are not guarantees of future performance and involve certain risks and uncertainties, which are difficult to predict. Past performance is not indicative of future results. Diversification does not assure a profit or protect against loss in declining markets. All indices are unmanaged and investors cannot invest directly into an index. The Dow Jones Industrial Average is a price-weighted average of 30 actively traded blue-chip stocks. The S&P 500 Index is a broad-based measurement of changes in stock market conditions based on the average performance of 500 widely held common stocks. The Nasdaq Composite Index measures the performance of all issues listed in the Nasdaq Stock Market, except for rights, warrants, units, and convertible debentures. The MSCI EAFE Index is a float-adjusted market capitalization index designed to measure developed market equity performance, excluding the U.S. and Canada. The MSCI Emerging Markets Index is a market capitalization-weighted index composed of companies representative of the market structure of 26 emerging market countries in Europe, Latin America, and the Pacific Basin. It excludes closed markets and those shares in otherwise free markets that are not purchasable by foreigners. The Barclays Capital Aggregate Bond Index is an unmanaged market value-weighted index representing securities that are SEC-registered, taxable, and dollar-denominated. It covers the U.S. investment-grade fixed-rate bond market, with index components for a combination of the Barclays Capital government and corporate securities, mortgage-backed pass-through securities, and asset-backed securities. The Barclays Capital U.S. Corporate High Yield Index covers the USD-denominated, non-investment-grade, fixed-rate, taxable corporate bond market. Securities are classified as high-yield if the middle rating of Moody’s, Fitch, and S&P is Ba1/BB+/BB+ or below. Third Party Administrator (TPA) services offered by Summit Financial Corporation are separate and unrelated to Commonwealth.